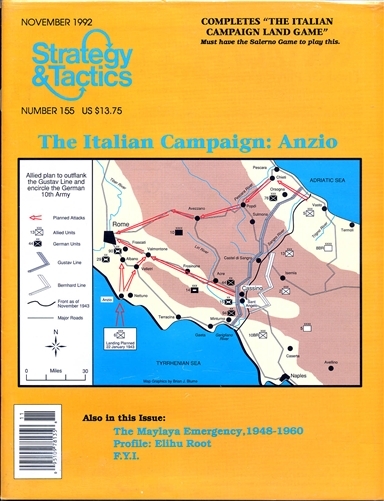 The third of four operational level games (Sicily-#146, Salerno, Anzio and Med War- #160) simulating the Battle for Italy in World War II using the Westwar Gaming System developed by Vanguard Games. This game completes The Italian Campaign series land game and cannot be played by itself; ownership of Salerno is required. The map scale is approximately five miles per hex with a unit scale of regiments, brigades, battalions and some companies. Game turns simulate one to two days of activity; each box on the time track represents approximately 12 hours. The playing pieces represent the combat units, headquarters and assorted markers necessary to play the game.